Who's better, who's best? 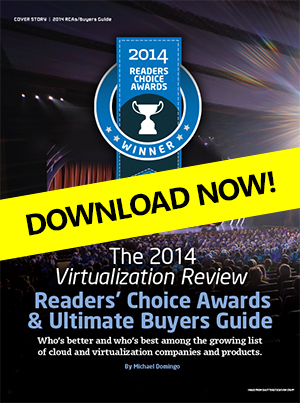 Readers voted and we tallied the results, and the final product is this year's 2014 Virtualization Review Readers' Choice Awards and Ultimate Buyer's Guide. This year's guide is bigger, even with the number of mergers and acquisitions that have taken place in the past year since we put together the last guide. It's a testament to a vibrant market that continues to experience innovations, improvements and evolutions in the technology that is helping enterprises make data more accessible, mobile, cost-effective and secure all at the same time. Right off you'll notice that we made a slight change to the awards. Last year's Preferred Products are now called Finalists. It's a subtle change, but one that we think better acknowledges the products and services that deserve recognition. In some cases, the difference for some of the finalists were one or two votes. VMware had a busy year innovation-wise, and it shows in this year's results: The cloud company topped nine categories, two more than last time (one of them, though, could be chalked up to an acquisition). Citrix Systems Inc. once again took its place on the podium with six RCA Finalist awards, but was able to garner one RCA Winner Award for ShareFile. Microsoft, IBM, and Cisco made strong showings, and there were also some surprises from smaller companies who made the list this year. Check out the PDF for the results. One more note: We've made this guide as comprehensive as possible, but we know it's not as complete is it can be. Help us improve and expand--if you know of a virtualization or cloud product or company that should be included here and in next year's guide, do send me an e-mail at mdomingo@1105media.com with "2014 Buyer's Guide Additions" on the subject line of your message.